Caistor Yarborough Academy opened its doors to showcase the variety of subjects it has to offer in its Creativity department. 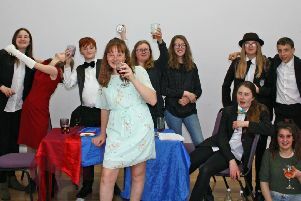 The open evening started with music and drama performances by students from all year groups and, after a short interval, where refreshments and canapés were available, visitors were given a tour of the department, which incorporates PE, food technology, music, drama and art. An introductory talk was given about the forthcoming engineering opportunities at the school. From this September, the academy will be offering students a course in engineering. Development of the engineering classroom is well under way. Pictured are students Isobelle Keyworth (Yr 9) and Tommy Newton (Yr 7) with teacher Peter Eggington and Simon Chadwick. “We were extremely pleased with the high number of people that attended the event,” said head teacher Jeremy Newnham.